Many factors cause Internet outages–from big events like Hurricane Sandy in 2012 and the Egyptian Internet shutdown in Jan.~2011 to small outages every day that go unpublicized. We need reliable methods to detect Internet outages, to report them, and to understand their causes and trends, all so we can improve network reliability. This project is developing new methods to provide near-real time detection of Internet outages, to build our understanding of what outages mean, and to provide reports of outages to others. 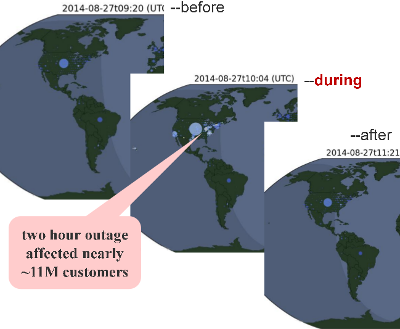 The outcome of our work will be datasets that identify network outages around the world, new methods that let us view and classify outages in this data, and a deployed system that reports outages in near-real time (within hours of their onset). This project builds on our prior work on the Trinocular outage detection system and earlier work on whole Internet censuses and surveys. Please see our technical summary about ouages for a complete technical description, including pointers to animations, technical papers, and datasets. This project is carried out at USC’s Information Sciences Institute. We are collaborating with FCC Bureau of Public Safety and Homeland Security. We thank USC/ISI (both the Marina del Rey and Arlington locations), Colorado State University, Keio University, the Athens University of Economics and Business, and SURFNet in the Netherlands. DUIO is a subproject of Retro-Future Bridge and Outages with additional external support. Retro-future Bridge and Outages is supported by the Department of Homeland Security (DHS) Science and Technology Directorate, Cyber Security Division (DHS S&T/CSD) via contract number HHSP233201600010C. The views and conclusions contained herein are those of the authors and should not be interpreted as necessarily representing the official policies or endorsements, either expressed or implied, of the Department of Homeland Security. Our Outage World Map is supported by a 2017 Michael Keston Research Grant through a gift to USC. 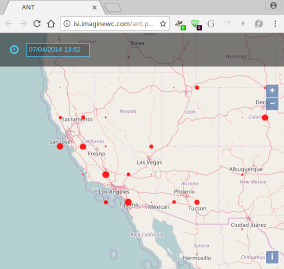 The Outage World Map is being developed by Domink Staros as part of his work at USC/ISI.